‘Growing up, we always had an active choir for every Mass. Even in surrounding parishes there was always music during the service. Because of this I took having a choir for granted. Being a part of the Milford choir really opened my eyes to the service they provide. Being a part of the choir, I was able to experience all of the time and effort they put into bringing music to the parish. It requires hours of preparation, commitment and teamwork. I was also surprised at how much the parish appreciated these efforts. Every week someone new came up and thanked us for singing and there were always many appreciative faces in the congregation. It was humbling to realize that our simple music was so well-liked. Through this volunteer experience, I realized how important it is to offer what abilities you have whether you’re the best person for the job or not. This applies to academics in an interesting way. Even if you aren’t at the top of the class, you can still make valid contributions in the outside world. Because of this, classes become more about learning everything you can rather than simply trying to get a certain grade. I found that it is more important to spend time studying the practical applications of a class rather than studying definitions. In this way, you have all the necessary skills to contribute in the professional world, which is the goal of attending a university. As a dance major, it was interesting to compare a stage performance to the performance of singing in a small parish choir. Singing in the choir, I was able to simply be myself without trying to bring anything else into it. I had never tried to simply be myself while performing before. I was able to bring this experience into my dance practice to make it more authentic. By the end of the semester, I noticed the difference in my dance performances and so did my professors. I have always enjoyed volunteering as I find it to be a very important part of contributing to society and of self-development. The more time I spend volunteering, the more I become aware of the needs of others. Coming to the University of Limerick, I knew that I wanted to volunteer regularly. In addition, I have been looking for ways to volunteer that are a little closer to my everyday reality. I’ve done various service activities throughout the years, but many of them were for needs outside of my community or for people I had never met. Although this work is very important too, I was curious to see what the people directly around me needed. As mentioned above, I grew up always having music during Mass. When I went to Mass for the first time at Milford Church, there wasn’t any music. The following week, there were a few students providing music. As I had some experience participating during Mass, this seemed like an area where I could be useful. I could see that there was a real need for music at this parish, and I wanted to be a part of bringing music to the congregation. 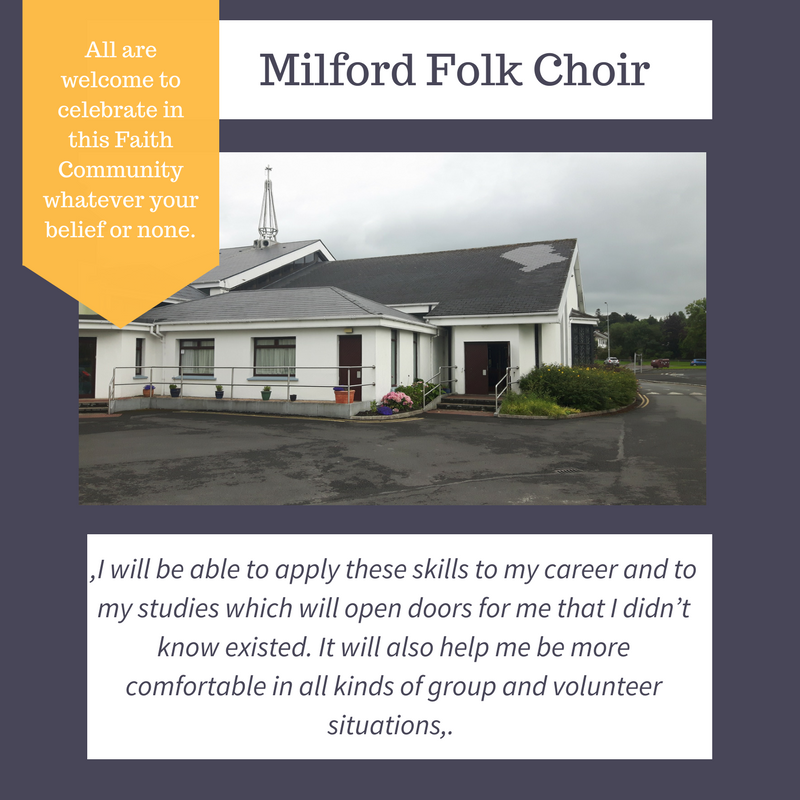 Although the Milford Folk Group has been around for many years, all of the members this semester were new to the group. Because of this, we were able to develop our own systems and unique group style. In this way, we all acted as co-founders of the group. It was important to the success of the group that everyone voiced their thoughts and opinions, however, at times it was necessary for someone to make a final decision. Although I rarely attempted to insist on anything, I would often lead an informal vote among the group. I also helped the group stay on time and organize the order of events. This experience made me realize that there are many ways to help better the community without going very far outside your daily routine. Usually with the word ‘volunteering’, I think of helping the poor and sick, however, offering a service to the average citizen can also be a significant service. Seeing the congregation enjoying the music so much was very heart warming. It also made me realize that internal pains are just as important to attend to, they are just harder to see. On the outside someone may seem to have everything they need, but on the inside they are hurting just as much and the simple act of providing beautiful music is enough to lift their spirits a little. You never know how much the smallest acts of service can change someone’s life. This entire project was based on teamwork. Every week we worked as a democracy coming up with which songs to sing and how to set up the space. It was important that we listened to everyone’s opinions and kept the group connected as a whole. At times it was difficult to keep the conversation on track and to make sure that everyone’s voices were heard. We didn’t have a designated leader or any set formula for how the meetings should go. This gave us a lot of freedom but it also meant more effort and patience from everyone. It also required some people to take on an unofficial leadership role in order to keep the group intact. In addition, there were only a handful of regular members with others coming in and out of the group. This meant that the dynamics of the group were always shifting and developing. Because of this, all group members, but especially the more permanent members, had to remain flexible in their ideas in order for things to go well. Overall, I believe the group did a nice job of remaining open and positive to everyone’s input and abilities. This volunteer experience has already affected my life and will continue to affect it in the years to come. This group was unlike any I had been a part of before, and it opened my understanding of how group communication should go. I learned a lot about how to communicate in an informal group and work with individuals from all around the globe. I also learned that you don’t have to be good at something for others to really appreciate you stepping up to do it. This will cross over into my personal and professional life. I will be able to apply these skills to my career and to my studies which will open doors for me that I didn’t know existed. It will also help me be more comfortable in all kinds of group and volunteer situations’.